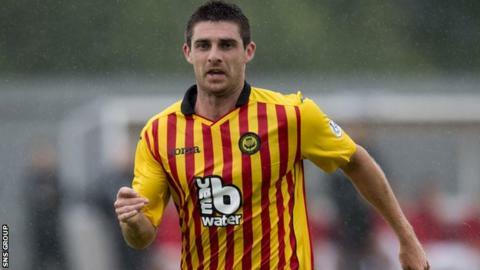 A late first-half strike from Kris Doolan was enough to send Partick Partick Thistle into the third round of League Cup. But the Premiership visitors were made to fight all the way by Morton. Doolan swivelled smartly to fire home from 15 yards after Stefan McCluskey had headed a great chance wide for Ton. Nico Caraux made a fine save to keep out thumping shot from Jags' Kallum Higginbotham and McCluskey missed the target from an inviting position. Conrad Balatoni passed up a fine chance to put the visitors in front with a close-range header when he failed to make a proper connection and looped his effort over the top from seven yards. Caraux made the first serious save of the match on 25 minutes to smother a 20-yard drive at his far post from Steve Lawless. Just three minutes from the interval and Ton scorned an ideal chance to break the deadlock after Thistle's Abdul Osman clattered Lee Kilday on the right to concede a free-kick. Reece Hands teased in a terrific ball to pick out unmarked McCluskey at the back post, but from six yards his attempted header skidded beyond the far post. And Jags punished them with the opener in first half added-time when Doolan gathered a harmless looking ball in the box before suddenly found space to shoot across Caraux and inside the post. Thistle should have had the tie wrapped up after 53 minutes when Lawless robbed Kilday and fed Stephen O'Donnell who then found Higginbotham on the left of the box. But his ferocious shot was brilliantly beaten out by Caraux. And a minute later, McCluskey blew a great chance to level the clash after dispossessing last-man Balatoni at the edge of the box. But after closing in on goal, and luring keeper Paul Gallacher from his line, McCluskey curled a 15-yard shot around the far post. Doolan came close to a second goal for Partick with a sweet, swerving shot which slipped inches beyond the far post. Morton were claiming for a penalty when McCluskey went down but all the home player got was a yellow card for diving after 71 minutes by referee Stephen Finnie. Match ends, Morton 0, Partick Thistle 1. Second Half ends, Morton 0, Partick Thistle 1. Corner, Partick Thistle. Conceded by Ricki Lamie. Corner, Partick Thistle. Conceded by Sean Crighton. Joe McKee (Morton) is shown the yellow card. Attempt saved. Thomas O'Ware (Morton) header from the centre of the box is saved in the centre of the goal. Stefan Milojevic (Morton) wins a free kick in the attacking half. Substitution, Morton. David McNeil replaces Conor Pepper because of an injury. Substitution, Partick Thistle. Stuart Bannigan replaces Kallum Higginbotham. Corner, Partick Thistle. Conceded by Lee Kilday. Foul by Dale Keenan (Partick Thistle). Conor Pepper (Morton) wins a free kick in the attacking half. Attempt saved. Thomas O'Ware (Morton) header from the centre of the box is saved in the top centre of the goal. Thomas O'Ware (Morton) wins a free kick in the defensive half. Substitution, Morton. Thomas O'Ware replaces Stefan McCluskey. Substitution, Partick Thistle. Christie Elliott replaces Steven Lawless. Substitution, Morton. Joe McKee replaces Reece Hands. Reece Hands (Morton) wins a free kick in the defensive half. Attempt missed. Stephen O'Donnell (Partick Thistle) left footed shot from outside the box is just a bit too high. Abdul Osman (Partick Thistle) wins a free kick on the left wing. Substitution, Partick Thistle. Ryan Stevenson replaces James Craigen. Attempt missed. Kris Doolan (Partick Thistle) left footed shot from outside the box misses to the left. Attempt missed. Sean Crighton (Morton) right footed shot from outside the box is just a bit too high. Corner, Morton. Conceded by Conrad Balatoni. Attempt missed. Stefan McCluskey (Morton) right footed shot from outside the box is close, but misses to the right. Corner, Partick Thistle. Conceded by Stefan Milojevic.